Thanks to the internet and a larger movement focused on how at-home solutions can serve common needs, the DIY movement seems stronger than ever right now. While it may be useful for your wardrobe or wedding invitations, when it comes to anything related to your teeth, it’s best to leave the hard stuff to the professionals. Below, find key reasons to turn to your dentist for orthodontic treatment, especially. DIY braces are an attempt to realign crooked teeth using materials you can find at home. These methods can range from super glue to dental floss, all with mixed results. Paper clips to realign bite issues like overbite, etc. 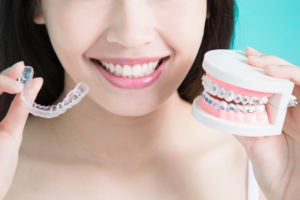 This fad is spreading unfortunately quickly across the internet, often among younger patients who may not realize the implications of at-home orthodontic treatment. Unfortunately, there are a host of potential problems that can occur when trying do-it-yourself braces. First of all, these materials are not sanitary or medical-grade, and can leave you at risk of getting sick or being exposed to hazardous metals and materials. But, most importantly, there is a reason treatment with braces is completed over the course of a year or more. Moving the teeth should be completed gradually to prevent injury to the tooth’s roots. While DIY methods may seem like a magic quick-fix, they can often cut off blood flow to the tooth’s root and cause the pearly whites to be lost completely. Any positive results will be temporary, as the teeth will be eager to move back into the original position. Many times, patients end up spending far more on retreatment after DIY braces have been attempted. You could accidentally swallow foreign objects or puncture the soft oral tissues on your quest for straighter teeth. We all want a quick fix for any given problem — but when it comes to straightening out your teeth, there really isn’t one. Fortunately, there is a way to avoid wearing metal brackets and wires for a year or more when you choose Invisalign. This clear aligner system can help you achieve straighter teeth and a more beautiful smile without all the visible hardware required with fixed braces. Don’t hesitate to get in touch with your cosmetic dentist to discuss this wonderful option — and skip the DIY! At Mitchell Smile Design, Dr. Brad Mitchell and his team offer professional solutions for patients of all ages. To learn more about Invisalign or how you can reverse the damage done by DIY braces, you are invited to contact the office at 405-755-2670.